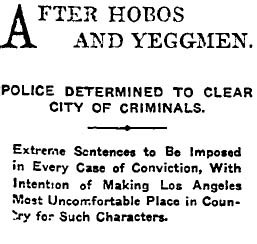 An influx of crooks, petty hoodlums and vagrants drawn by good weather and horse racing at Santa Anita are blamed for a siege of crime throughout the city. The jail is so crowded—300 being held in a building designed for 125—that 95 men arrested for intoxication between Saturday night and Monday morning were released because there was no room for them. Drunks who posed no danger were merely put on a streetcar for a ride home, The Times says. Carl Chrisensen [Christensen? ], who had just served two months for vagrancy, was among 35 men sentenced to the chain gang for being homeless. Officers said Christensen begged at the back doors of homes and wore fraternal pins of the Masons and Eagles to gain housewives’ sympathy. When arrested, he was found to be carrying burglary tools, and he was sentenced to six months’ hard labor. Two black LAPD officers, Glenn and Stevens, said they arrested a pair of robbers while looking for hobos in the Southern Pacific railroad yards near 4th Street. The officers said that one man begged for money while the other man tried to get behind them. Officer Glenn whirled around and stuck his service pistol in the man’s stomach. When arrested, the man was found to be gripping a heavy revolver in his pocket. Officers Glenn and Stevens also reported raiding a gambling operation at 1st Street and San Pedro, arresting “twenty-two bad Negroes, men and women,” according to The Times. In other crime news, a woman is being sought after throwing her infant from the inbound California Limited around Rancho Cucamonga. A man on the train saw the baby land in mud and leaped off to rescue it. Robbers broke into the Dake’s Lunch Room in the basement at 414½ S. Broadway, slid the safe into “a big ice chest” and blew it open with nitroglycerin, taking about $75 ($1,539.27 USD 2005) but ignoring several checks. “The lunchroom is located on one of the busiest streets of the city and supposed to be protected by the police and by two or three agency officers who patrol the stores, yet the robbers worked with safety and had plenty of time,” The Times says. Finally, Police Surgeon Joseph B. Tanner is recuperating after a brawl at the Receiving Hospital with Frank Scholtz, who was arrested for being insane. Because the mental ward is overcrowded, patients have to be placed with the general population of the hospital, The Times says. As Tanner was hurrying to attend to an emergency, Scholtz grabbed him by the coat and began hitting him, smashing Tanner’s eyeglasses so that the broken shards cut his face. Tanner wrestled Scholtz to the floor and the men rolled over and over until Tanner got on top and beat and choked Scholtz into submission, The Times said. Police Surgeon Quint rushed to Tanner’s aid and handcuffed Scholtz, then treated Tanner’s wounds. The Times is curiously silent on what treatment, if any, was administered to Scholtz. This entry was posted in 1907, African Americans, Crime and Courts, LAPD, Medicine, Transportation and tagged 1907, African Americans, burglaries, crime and courts, hospitals, lapd. Bookmark the permalink.